Today, Saturday 26 November 2016, at Chour Khour Restaurant in Battambang, the international Farmers’ Dialogue was welcomed by the Cambodian organizing IofC team. 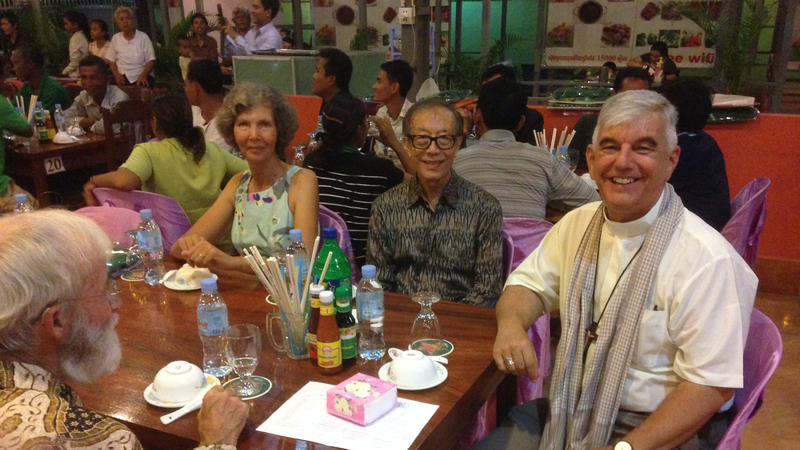 The catholic Bishop Enrique Figaredo Alvargonzalez of the Battambang Apostolic Prefecture greeted 100 participants and many other guests before blessing the gathering. On Sunday, the official inauguration of the Dialogue will take place with the presence and the address of the Deputy Governor of Battambang Province. Buddhist monks will then bless the gathering and all participants will sing the national anthem. After the blessing dance and the reading of a message from the King, the exchanges and dialogues will begin. The theme of the Dialogue is: 'The resilience of farmers and the future of the ASEAN farmers; looking forward to sharing, solidarity and cooperation'. Apart from 70 Cambodian farmers, 18 other delegates come from Australia, Canada, France, Germany, Japan, Korea and Taiwan.